The vision of the General Surgical Oncology fellowship at the University of Toronto is to train local, national and international leaders in surgical oncology. The University of Toronto General Surgery Oncology Program offers two-year training in General Surgical Oncology (GSO) or combined General Surgery Oncology / Hepatobiliarypancreatic (HPB) surgery. We accept 4 fellows per year. Three fellows enter the General Surgery Oncology track and one fellow will enter the General Surgery Oncology/ HPB track. Applicants (national and international) are interviewed and ranked through the National Residency Matching Program (NRMP) as two separate tracks. The University of Toronto was founded in 1996 and is fully approved by the Society of Surgical Oncology (2003), and the Royal College of Physicians and Surgeons of Canada (RCPSC) (1997). The ACGME recognizes the training in RCPSC approved GSO program and there is a reciprocity agreement between the two accrediting bodies. The GSO/HPB fellow is eligible for dual certification by the Hepatobiliary Pancreatic Association (HPBA) and the ACGME/ RCPSC in General Surgical Oncology. The European Board of Surgical Oncology also recognizes training at the University of Toronto (2012). Fellows in this program benefit from exposure to faculty and facilities at two cancer centres with distinct yet complementary strengths: the Princess Margaret Comprehensive Cancer Centre, located in downtown Toronto, and the Edmond Odette Regional Cancer Centre at Sunnybrook Health Sciences Centre, located uptown. 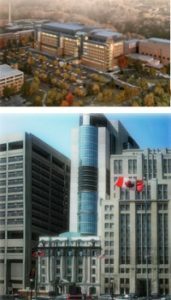 These two cancer centres serve the Greater Toronto Area (population 5.5 million) and are referral centres for complex cancer patients for the province of Ontario (13.6 million). The Princess Margaret Hospital and its affiliates form the fifth largest cancer centre in North America and see 12,430 new cancer patients per year, complete 6447 cancer surgeries and have 130 in-patient beds. The Edmond Odette Cancer Centre at Sunnybrook Health Sciences Centre is the sixth largest cancer centre in North America and serves 17,181 new cancer patients per year, completes 2727 cancer surgeries and has 1275 in-patient beds including 103 cancer program patient beds. Both centres are actively involved in clinical trials. During the fellowship, all fellows rotate through Surgical Oncology services at both centres including core rotations in Lower GI (3 months, uptown or downtown), Sarcoma (3 months, downtown), Peritoneal Rotation (3 months, downtown), 3 months of and Breast Cancer (downtown) and 3 months of Melanoma (uptown). The Lower GI and HPB rotation features strong experience in laparoscopic surgery. Fellows will also receive training in one-month rotations each of radiation oncology, medical oncology, and surgical pathology. There are 3-6 months of electives which can include minimally invasive surgery, HPB, gastric cancer, sarcoma, peritoneal malignancy, oncoplastic breast surgery, head and neck surgery, research and can take place either in Toronto or at other international centres. All rotations involve and emphasize interaction with colleagues in other oncologic disciplines in multidisciplinary clinics, tumor boards, rounds and in the operating theatre. In the second year, the GSO/ HPB fellow focuses on HPB completing 9 months on a high volume HPB service at the Edmond Odette Regional Cancer Centre at Sunnybrook Health Sciences Centre. Operative experience includes laparoscopic and advanced open HPB procedures, gastric cancer resections, adrenalectomies, intra-operative ultrasound and exposure to a hepatic arterial infusion pump program. Clinic experience includes interprofessional HPB clinics and a dedicated multidisciplinary neuroendocrine clinic at the Susan Leslie Clinic for Neuroendocrine Tumours. Research opportunities through active clinical trials or through the Odette Cancer Centre HPB Database are also available. Our GSO Fellowship Program makes a concerted effort to respect the learning needs of both the fellows and the residents, and for the most part the interactions between the two are mutually beneficial. Fellows have an identified clinical and research mentor during the fellowship. It is expected that each fellow will complete at least one research project during the fellowship and that this project will be submitted to a major meeting and for publication. The research project will also be presented at the annual Research Day for the GSO program. The formal education program includes a weekly lecture and seminar series which may be attended by the by the other surgical oncology disciplines including Gynecologic Oncology, Urologic Oncology, Orthopedic Oncology, and HPB/transplant fellows. There are also monthly journal clubs organized by the fellows and attended by staff. The seminar series are complemented by institutional rounds, tumour boards, and conferences. A surgical ‘boot camp’ which focuses on minimally invasive surgical skills and research skills (lecture series) occurs in July for the first year fellows. A leadership course for surgeons has been developed for the fellows in conjunction with the Rotman School of Management at the University of Toronto and is also mandatory. All first-year fellows also participate in a quality improvement course sponsored by the Department of Surgery at the University of Toronto. The Surgical Oncology Manual reflects the current approach to the management of Surgical Oncology in General Surgery at the University of Toronto (published 2012). It provides a practical, up to date approach to the management of breast cancer, sarcoma, peritoneal malignancies, colon and rectal cancer, gastric cancer, NETs, melanoma, liver and pancreas cancer. The disease site chapters balance clinician experience with evidence-supported practice with seminal papers described in chart form within each chapter. The manual is used as the basis for the lecture curriculum for the fellows. The second edition will be published by Springer in 2016. Successful applicants will have completed or anticipate completion of residency training in a recognized General Surgery training program. Fellows receive full salary support. In addition, all our fellows are provided with support to attend the SSO Annual Cancer Symposium as well as the annual Canadian Society of Surgical Oncology meeting.